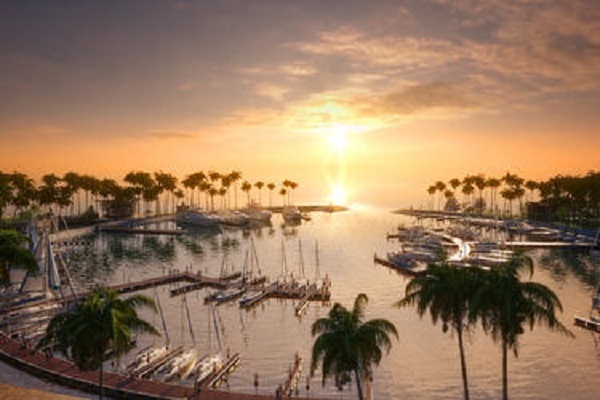 Singha Estate Public Company, a premier global property developer, said it has signed an agreement with UAE-based Jalboot Holdings to manage its luxury marina at Crossroads, the largest integrated destination in the Maldives. Jalboot Holdings is a leading integrated provider of vessel design, construction and operation of sightseeing and passenger transfer ferry services based in Abu Dhabi, UAE. Founded in 2013, the company has surged to the frontline of the marine transport service industry, and in addition also provides private and commercial boat charters. Jalboot said with its close proximity - a 15 minute boat ride from Velana International Airport and Male, the capital city of Maldives, Crossroads aims to captivate leisure travelers and family markets with a development spanning nine islands, boasting 1,300 rooms and a retail space of over 11,000 sq m.
According to Jalboot, the project's leisure and entertainment hub, The Township, will house a variety of international restaurants, retail outlets, a world-class wellness spa, a Maldives Discovery Centre with coral preservation and coral propagation activities, a diving centre, a multi-purpose hall, a kids club, and a cultural centre. World-renowned partners at the Township include Hard Rock Cafe Maldives, Cafe del Mar, and two of Asia's 50 Best Restaurants, Ministry of Crab and Nihonbashi. Besides managing Crossroads' luxurious berth yacht marina, Jalboot will be providing a comprehensive range of luxury cruise services at the integrated destination totalling six vessels. Jalboot's vessels have been uniquely designed for the Maldives-based Crossroads, fully equipped with air-conditioning, and having the capacity to transport over 4,000 passengers per day, it added. Singha Estate Public Company CEO Naris Cheyklin said: "We are very excited about this collaboration with Jalboot. They are the perfect partner for Crossroads as our upscale water transportation and services that will bring in the new marina experiences." "The creative DNA of Jalboot and Singha Estate are very similar," remarked Jalboot Holdings CEO Mohamed Roestali and Group Chief Financial Officer Thomas Rebollini. "Singha Estate is a very progressive organization that has brought the first marina and the first inter-linked resort of its kind to the Maldives," the duo stated. "Among our many similarities, Jalboot has trail-blazed the creation of a water transport network in the UAE as well. Together, we can create an experience unlike any others in the Maldives," he added. Inspired by cultures from the East and the West at the crossing of Maritime Silk Road, the project is situated within the 7 km-long lagoon just 15 minutes from Male International Airport by speed boat presenting an easy access and unique offerings for travellers as well as the residents of the capital city.